Andrew Linde is a co-founder of The Benview Network, a podcast network featuring his shows Nerd's Eye View and shut up, leonard as well as Pop Sickles, Benson's Boombox and more. He watches many films and enjoys some of them. French director Olivier Assayas has teamed up with Kristen Stewart once again to deliver a haunting mystery in Personal Shopper. Following up last year’s Clouds of Sils Maria, Stewart takes the lead as Maureen, grieving her brother and biding her time working for a self-absorbed model. Her performance is at once manic and laconic, something that Stewart is a master of and Assayas knows how to show off. In an interview with The Independent, Assayas said, “I don’t think I would’ve written this screenplay if I had not known Kristen.” He truly plays to her strengths, having written a character who is unlike most seen in mainstream cinema. Maureen is unfrightened of the unknown, searching for answers with unlikely methods. But Stewart still manages to make her vulnerable in a nuanced performance. Maureen (Stewart) watching a video on her iPhone. The story is teased out over the course of an hour and 45 minutes, and is best experienced with little preface. Assayas masterfully allows the story to be told in whatever medium it works best. Maureen hears about an artist who was inspired by spirit mediums and watches a video about her on her phone. A whole sequence of the film is told through text, while Maureen is traveling. This isn’t done with fancy text on screen, but with stolen glances at her iPhone. Shot like this, the film feels more natural and doesn’t allow technology to overtake the filmmaking process. Stewart made waves when she won France’s Cesar award for Best Actress, the first American to do so, for Assayas’ 2015 film Clouds of Sils Maria. Her role there is not dissimilar from her role in Personal Shopper, an assistant to some sort of celebrity. Clearly she excels at it. 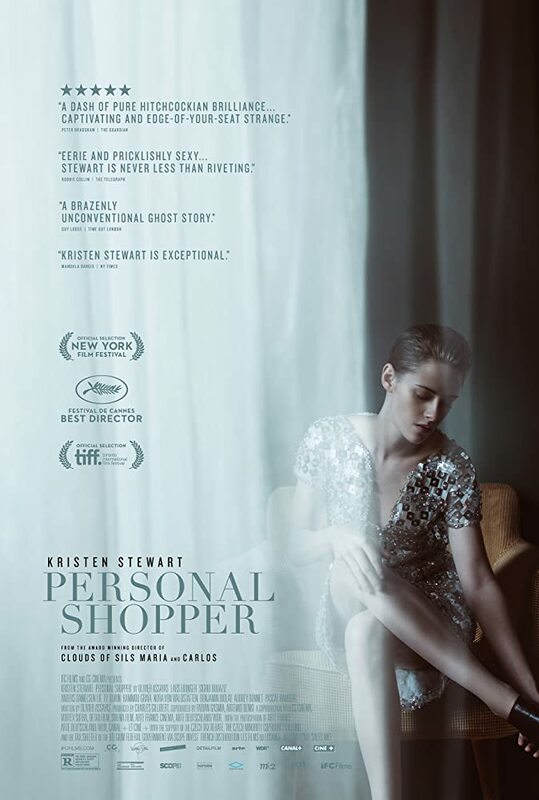 Personal Shopper is a startling film, and if anyone doubts that Stewart is better than her days in the Twilight films, then they should check it out.